Lewis Hamilton (1st, 1:30.076): "We had such a difficult day yesterday; it was difficult to know where we stood. I didn't sleep very well last night, just like all my engineers, because we didn't know whether we were going to fix the issue or not. But today we arrived and the car was much better. The Q3 laps, particularly the first one, were very well put together. To be honest, I didn't really know where it came from. So it's a bit of a surprise to be on pole, but I'm very grateful. It's always a special thing when you're able to extract a little bit more out of the car. That's what I've always enjoyed since my dad would say that my first go-kart was fifth hand. I don't really know what happened to Sebastian. It's very unfortunate for him, but of course we have to try to maximise on every opportunity that we get. We still have a very tough race ahead of us, so we will keep our heads down. Today, every time I left the garage or came back in I could see the crowd and all those flags opposite my garage - I'm incredibly grateful for that and get a lot of energy from it." Valtteri Bottas (5th, 1:30.758): "It's been a difficult weekend for us and we've been quite far behind at times. Compared to yesterday we made a step forward; today was a lot better, but still not good enough for me. Lewis and I did end up with completely different cars in terms of aero package for the qualifying. It seemed to be working for him but not so much for me. Qualifying wasn't going too bad until the second session. But in qualy three, everyone else could improve quite a bit but I couldn't. We need to analyse everything, it is too early to say why I couldn't improve from Q2 to Q3. I'm feeling very disappointed after the qualifying, but tomorrow is a new day. It is going to be a challenge for us; so far, our long run performance has not been great this weekend. But we will try and give it everything we can." Toto Wolff: "So far this weekend we have seen a pretty confusing picture of performance, with different cars quick at different times and even big gaps between team-mates. Our struggle has been to get the tyres into the right working window, then things came together this afternoon as the track temperatures cooled. After a tough Friday, the team here at the track and back at base did a good, calm job to analyse the situation and come up with some improvements. And then, when it really counted, Lewis was able to put together a blistering lap to take pole - something we didn't expect at all going into qualifying. It was really a great job from him. Valtteri found it harder today but it's clear that tiny differences in set-up or tyre temperatures are making a big difference in lap time, and it didn't quite come together in Q3. There's no doubt this session was also a tough moment for Ferrari, with Sebastian unable to take part, but there are no points scored on Saturday. They have had the strongest race pace this weekend and will be a serious threat in the race. We can't pretend that we have all the answers right now, but we can be pleased with the outcome today and are ready to fight hard in the race." Andrew Shovlin: "Our programme today in FP3 was focused on collecting more data about our latest upgrades, running the cars in different configurations to make that comparison. We collected a lot of information, and will continue to do so during tomorrow's race. There was a lot of work done overnight at the factory and the track to try and understand the limitations we encountered on Friday, and propose changes to be evaluated during FP3. Both drivers felt we had taken the car in a positive direction and they had more confidence in the handling. However we were not expecting to be on pole today and the fact that we are is the result of a great lap by Lewis; equally, we should recognise it might have been a different story had Sebastian taken part in the session. Valtteri had a trickier time this afternoon, his pace was good in the earlier part of qualifying but he was not finding the same track improvement as Lewis and this is another indication that we are struggling to put the car into the right window. We are not expecting an easy race, because both Red Bull and Ferrari produced very good long runs, while our car has been difficult to work with on high fuel. It will be a tough challenge tomorrow - but we will approach it with the mind-set of maximising our potential and taking the opportunities that present themselves." Max Verstappen (3rd, 1:30.541): "Third in Qualifying is a pretty good birthday present today. The whole weekend I was not fully happy with the car and in the last practice session I didn't have the perfect balance, but in Qualifying we managed to pull it together and the car was pretty good. To be four or five tenths off pole position on this track and knowing they can turn up their engines in Qualifying means we are doing a good job. I think on the long runs we are a bit more competitive so I'm definitely looking forward to tomorrow. So far on Saturdays I've been a happy guy and on Sundays that has changed. Let's hope it is different tomorrow and I'm sure we can have a good race. I'm also hoping for no sandwiches!" Daniel Ricciardo (4th, 1:30.595): "I did all I could today and I think we both got the most out of the car. We're half a second from Lewis around here so I think we can be pretty happy with that. It gives us a chance in the race tomorrow even if it's dry. I would have loved to be on third today, but that half a tenth was actually Max's birthday gift from me and I wanted to start on fourth really, because that's where I started last year and I won. This is obviously all planned in my mind. I did a bit of a lift of the throttle just before the finish line, so yeah it's of course all calculated. I think Seb is probably going to do a rain dance tonight so I might join him, hold hands and light some candles. But honestly, some rain would be interesting for the race, so we can dance tonight, as long as we don't dance tomorrow. If he gets near me then, we haven't had a good enough race." Christian Horner, Sporting Director: "A very positive Qualifying for us today. To have locked out the second row and to be within half a second of pole at this circuit represents a job very well done. With Max and Daniel in P3 and P4 respectively on tomorrow's grid, and on the evidence of the weekend so far, we would hope to be competitive and able to have a say in how the race plays out. The conditions are predicted to be very different to today with some rain around, certainly for the start of the race, so it could be an interesting start and with Sebastian starting from the back, it is all set up for a compelling final grand prix around Sepang." Esteban Ocon (6th, 1:31.478): "I'm very happy with our performance today. The car has been working really well since the start of practice and it's clear that all the hard work we have done since Singapore has paid off. I think we found further performance today and all the small changes we made to the car really helped make the difference. So it's a great team effort and we are in good shape for tomorrow. My laps today were strong - probably some of my best of the season, but there is still room to improve. You never know what can happen in the race, but it's a good chance to score some big points." Sergio Perez (9th, 1:31.658): "It wasn't an easy qualifying session for me. I've been unwell this week and this is possibly the worst place to not feel 100%. I made a mistake in turn 11 during my final lap in Q3 and lost my rhythm. It was a small lock-up on what had been a very good lap until then, but it cost me enough time to be only ninth. It's still a good result, all things considered, and it puts us in a good position for the race. It's going to be a challenging Sunday because Malaysia is a very physical race - probably the hardest of the year. The start will be a key moment and I hope to gain a few places. It's a race in which anything can happen and the weather is always unpredictable. Yesterday's interruptions mean nobody really has a clear understanding of the long run pace, but I think we can come away with a strong result." Robert Fernley, Deputy Team Principal: "Sixth and ninth represents an excellent qualifying performance by the team. The car is working well and the drivers were happy with the balance heading into qualifying. Esteban's Q3 laps were clean and tidy, and he's well placed to score good points tomorrow. Sergio hasn't been feeling well all weekend, so all things considered ninth on the grid represents a tremendous effort. The car continues to improve with each race, which is a credit to the whole team and the hard work that goes in back at base and trackside. Tomorrow is a good opportunity for us to pick up some more important points to strengthen our fourth place in the championship." Felipe Massa (11th, 1:32.034): "I'm a little bit disappointed not to be in Q3. I was happy with the car and the balance. I had a great Q1 but I didn't have a perfect Q2, to be honest. On the first try I had a little bit of traffic on the high speed laps, which meant I lost a bit of time. And on the second try, the car was bouncing a bit on corner two so I lost a little bit of traction. All of these little problems were enough to lose position." Lance Stroll (13th, 1:32.307): "I think it was all right, and all in all it was a good effort from the team. It could have been a bit better in the first sector on my push lap, as on the out-lap the tyres were a bit cold, but overall it was a decent effort and at least we are in Q2. If it is wet tomorrow we would have a bit of an opportunity starting where we are starting, and so be able to capitalise on that. However, even in the dry it could be up to strategy and I think the rear tyres could be a big factor round here. It is always an interesting first corner here, so now we just have to concentrate on the job we have to do and try to get some points, and I do expect a long and hot race." Paddy Lowe, Chief Technical Officer: "We had a trouble-free session, but overall it was a bit of a disappointing result for us as I think we had the possibility of getting at least one car into Q3 today. The pace certainly seemed to be there in the earlier sessions, but we didn't quite make the same progress as other teams with each set of tyres, so ultimately just missed the cut. On the positive side, the car worked well. Both drivers were happy with the balance and extracted the maximum they were able to from the car. We're still in reasonably good positions to score some points in the race, so we're looking forward to tomorrow." Stoffel Vandoorne (7th, 1:31.582): "We weren't really expecting to be so high up the grid. We'd hoped to get into Q3, but fighting for seventh was a pleasant surprise. In fact, my whole qualifying session went really well. I didn't make any mistakes and pulled every sector on every lap. To qualify seventh on a circuit like this is probably about as good as it gets for us, so I'm very happy with my performance. We generally tend to be better over a single lap than across a race stint, so I think tomorrow will be tougher for us, but at least we're in a position to race. And nobody really has any race preparation runs under their belts [due to yesterday's FP2 red flag], so hopefully we can go into the race a little bit more prepared than the others and benefit from that. Hopefully we can make a race of it tomorrow." Fernando Alonso (10th, 1:31.704): "I'm satisfied with this result, and with how the weekend has gone in general, but it's going to be tough to maintain our qualifying position tomorrow. We know that our race pace is not as strong as our qualifying pace, so we'll probably struggle a little bit more if conditions remain dry. However, maybe some rain will affect the race - some mixed conditions would improve things for us. I think performance was there for us this weekend, and getting both cars in Q3 on this circuit is a very good sign. The new parts we brought here worked well yesterday but maybe didn't work as well today, so we will have a close look to that. It's a very close field: it's going to be tough to maintain our position tomorrow, but we'll do our best, as always." Eric Boullier, Racing Director: "Both drivers have worked very well together to develop and refine our car package across the weekend, and today's qualifying result really justifies their efforts. Stoffel has driven superbly all weekend, and absolutely nailed it in all three qualifying sessions, achieving his best F1 qualifying position so far. Fernando wasn't particularly happy with his final lap, but he still has a very good opportunity for tomorrow. Everyone's preparations for the race have been affected by the weather and yesterday's shortened practice sessions. We know we might not be as rapid in the race as we were in qualifying, but we're aware that there are a lot of questions marks still remaining about everyone's race pace. That'll hopefully make the grand prix more interesting and unpredictable, and we'll certainly be hoping to profit from that uncertainty tomorrow." Yusuke Hasegawa, Honda: "Today was a very positive day for everyone in the team. After yesterday's unstable weather, today's conditions were boiling hot temperatures with bright sunshine - the complete opposite to yesterday - therefore during FP3 this morning we focused on adjusting the settings ready for qualifying. In qualifying, both of our drivers did a great job to secure their positions in Q3. Stoffel in particular showed a great performance with P7, the best qualifying result of his career to date. I think it is a very good result that we were able to show competitiveness at this power-hungry circuit. Once again we did not have any issues on our PU today and we'll try our best effort to maintain this condition in tomorrow's race." Carlos Sainz (14th, 1:32.402): "I'm not surprised with ending up P14 today because it's more or less where we've been all weekend... It's for sure something we need to look into, because at the moment we're a bit too far away from Q3. Before coming here we thought we'd be performing a bit better than what we have done up until now - the updates we've brought here aren't really working as well as we expected, at least not for now. Having said that, it's also true that we haven't been able to do that many laps this weekend to properly learn about it all, so we just need to keep working hard. We usually come back a bit on race day, so hopefully we can be part of a good midfield battle and recover a bit of ground. If it rains, anything can happen as we saw in Singapore, so I welcome a wet race but, if not, we will just need to keep our heads down and see where we end up. Whatever happens, we will try and do our best, that's for sure!" Pierre Gasly (15th, 1:32.558): "I think today was positive and I'm happy - your first qualifying in Formula 1 is always a special moment and one I was really looking forward to! I tried to give my best and I think we made really good progress between FP3 and Qualifying. I felt comfortable in the car in Q1 and then, in Q2, I kept on learning while giving my all and I'd say we can be satisfied with the result! I now look forward to tomorrow, my first Formula 1 race and something I've been dreaming of since I was very young...! I expect it to be a really good experience and I hope to keep improving tomorrow as well. You never know what can happen with the weather here so, if the rain and tricky conditions do appear, I will welcome it as I felt confident in the wet in FP1 on Friday and I'm sure it will make it all even more exciting!" James Key, Technical Director: "A disappointing day today after only qualifying in P14 and P15. Even if we had brought some updates here, we certainly haven't been quick enough at this track - I think there wasn't much more to come from the car and I hope that our race pace will be a bit quicker than in today's Quali, which is normally the case. We've now got some ground to make up; we'll go back to the factory and understand why we are where we are at this particular track, but there are certain elements of this circuit that perhaps don't suit some of the characteristics of our car particularly well. Having said that, it was a good effort from both drivers - they got probably as much out of it as they could. Pierre has been really good all weekend. He's had very little time to prepare, completed very few laps, and to be just a few tenths behind his teammate is a really excellent performance from him in his first ever Qualifying. This is definitely a positive that we've taken from today. We now need to knuckle down for tomorrow and think about how we can limit the damage and try and move forwards." Romain Grosjean (16th, 1:33.308): "It's been pretty amazing what the team has been capable of doing after yesterday. It's such a great team and it shows how much we've improved since the beginning. They managed to repair the car after curfew, but still in a quick amount of time. I'm very proud of them, and I was happy I was able to go out. Unfortunately, we went out in Q1. We're working and we're trying to analyze everything we can. We're really doing our best, but these last few races we just haven't had much performance. We know the supersoft is not our best compound, in general. We're struggling to find the right window on tires. We need to just keep working on that. We're all in the same boat and working hard. It will pay off at one point. Tomorrow is a long race. It'll be very hot. The weather can be tricky. Let's try to get the best, as we did in Singapore, and hopefully score some points." 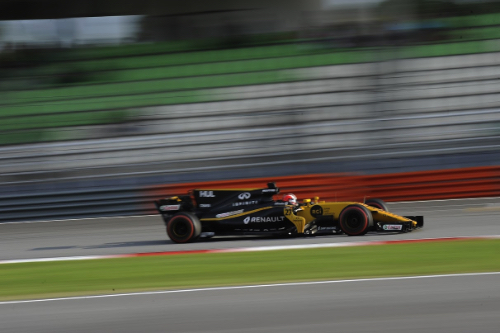 Kevin Magnussen (17th, 1:33.434): "The feeling was not too bad. It's just not competitive, I guess. It's tough for us, but that's how it is. The car isn't slow. It's been fast on other occasions, other races. We're just not consistent enough in some areas. Something is making our performance vary too much. We're working on it. The essential part is that we've designed a good baseline car. It's just that sometimes it won't work, and today was one of those days." Guenther Steiner, Team Principal: "The weekend doesn't seem to get any better. There's not much more that can go wrong, or worse, for tomorrow. We're having these weekends where nothing seems to be going right. This is one of them. We just need to try to get together again and do the best with what we can tomorrow." Nico Hulkenberg (8th, 1:31.607): "I'm quite happy with today's session. It's been a struggle for us all weekend, we didn't have the right balance and didn't have the speed. We weren't sure we were going to get into Q3 so I'm quite pleased with the results. We'll push for a little bit more tomorrow and look to get ahead of Mc Laren and Force India." Jolyon Palmer (12th, 1:32.100): "I'm a bit disappointed not to finish in the top 10 because we had good pace but in the end, we just missed out. We will start twelfth tomorrow and I hope to move forward, we only have to gain two places to get in the points. Anything can happen in the first few corners here so we should make it." Alan Permane, Sporting Director: "Struggling to find good balance but the team is in a good place. Qualifying was a little frustrating today as we would have liked to have both cars in Q3. We've been struggling a little more in Malaysia than the last few races. The car balance isn't where we want it to be this weekend and whilst we have made improvements, we aren't entirely satisfied. That said, the drivers were much happier on high fuel on Friday which gives us confidence for tomorrow's race. Nico will start eighth, behind the Mc Laren and Force India and is in a good position to score some decent points. Jolyon did a good job and will be starting twelfth from where he can definitely aim to be in the points." Pascal Wehrlein (18th, 1:33.483): "It was a decent qualifying - better than expected. It is positive that we were able to reduce the gap to our direct competition compared to the practice sessions. Now we look forward to the race and will see what's possible tomorrow." Marcus Ericsson (19th, 1:33.970): "It has not been an easy day for us. Realistically, we knew that we could not expect much more in qualifying. We did manage to come a bit closer to our direct competition today which is positive. However, we still have a long way to go to make further progress. We are now analysing the data so that we can make another step in the right direction."